In the early days of fly fishing, lines were made of plaited horsehair. This was later replaced by a lighter mixture of horsehair and silk, then by pure silk, plaited, tapered and dressed (impregnated and coated) with linseed oil. The oil-dressed silk line was in universal use for three-quarters of a century, until it was replaced by the modern plastic-coated fly lines which consist of a plaited Dacron core with a coating of polyvinyl chloride (PVC). For sinking fly lines, the PVC is impregnated with powdered metal, the quantity used determining the rate at which the line sinks through the water. PVC is a hard material unless it contains a suitable ‘plasticizer’, which is introduced during manufacture. The commonest cause of trouble with modern fly lines is loss of plasticizer from the PVC coating. This loss goes on all the time, but certain factors can accelerate it greatly. The use of grease, other than one of the special kinds that themselves contain plasticizer, will draw plasticizer out of the PVC very quickly, as will the various liquids intended to make dry-flies waterproof, should they get on the fly line. Some of these waterproofing liquids are sold in aerosol cans, and special care should be taken when using them, to ensure that the line is not sprayed. Another cause of plasticizer loss is leaving reel and line in hot places, such as a car parcel shelf exposed to bright sunshine, in glove pockets adjacent to car heaters, in cupboards near radiators or fires, and so on. There is little risk of ill effects from simply fishing on hot days, since the line is constantly being cooled by the water, but many a line has been ruined by being left in a closed car standing in the sun. Fortunately it can be restored by the use of special replasticizing grease such as ‘Permaplas’. But, if too much plasticizer has already been lost, the line coating becomes hard and cracks. Once that has hap- pened there is nothing that can be done to repair the damage. A wide variety of line is now available, identified by a code know as the AFTM (Association of Fishing Tackle Manufacturers) system. This code tells you the kind of taper the line has, the weight of the first 30ft of the line, and whether the line is a floating or a sinking one. So-called ‘level lines’ are of the same thickness all along their length; they are little used and their only merit is that they are cheap. They are designated by the letter L.
Double taper lines ‘Double taper lines’, designated DT, have both their ends tapered for more than 10ft, giving a fine end which falls more lightly on the water. The idea of a double taper is that when one end is worn, you can reverse the line on your reel and use the other. These lines usually come in lengths of 90ft. ‘Forward taper lines’, otherwise known as ‘weight-forward’ (WF) resemble the first 30ft or so of a double taper with 40ft of very fine fly line attached. (In fact there is no actual attachment, both core and coating are continuous.) This allows more line to be ‘shot’ through the rings when casting. Recently, lines have been introduced with the first, heavier part longer than 30ft. These are called ‘long belly lines’. ‘Shooting heads’ are similar in principle to ‘forward taper lines’, but instead of the fine shooting line being a continuation of the PVC – coated fly line, it consists of nylon monofilament attached to the fly line by a special knot. This allows even more line to be ‘shot’ in casting, and as the fly line is usually cut from a double taper, shooting heads are much cheaper than either double or forward taper lines. Good tackle shops will usually sell halves or ‘double tapers’ for making shooting heads, which will need a further reduction in length, usually to 30-36ft. All these lines can be of different floating or sinking qualities. There are floaters, slow sinkers, medium sinkers and fast sinkers, as well as floating lines with sinking tips. They are all available in a range of weights, numbered 3 to’12. The more powerful your rod, the heavier the line it will need. Let us look at some examples of coding. A line coded DT-7-F is a double-tapered floating line, weight WF-9-S is a forward taper sinking line, weight No 9 and so on. The reason why the weight number refers to the first 30ft or so of the line, is that 30ft is about as much as an average fly caster can control when he whips the line back and forth in false-casting. Good casters can handle more, but in practical fishing there is no advantage in having more than about 45ft, which only very good casters can handle. When you buy a rod you will find that its maker has specified what size line it will carry. Remember that this refers to 30ft of line in the air. If your rod has a recommendation of No 7 line, that means it will work nicely when you are switching 30ft of line in the air. If the kind of fishing you do involves mainly short casting, and you seldom have more than 24ft in the air, you will do better with the heavier No 8 line. If, on the other hand, you often put 35ft or more into the air, then you should use a lighter line. 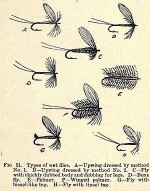 For dry fly and nymph fishing, floating lines are used: the sinking lines are mainly for lake and reservoir fishing when wet flies and lures of various kinds are needed. Slow sinkers sink at a rate of about 1ft in 7 seconds: medium sinkers 1ft in 5 seconds: fast sinkers, or as they are sometimes called, ‘Hi-D’ lines sink about 1ft in 3 seconds. By counting the seconds after casting, you can decide how deep you allow your line to sink before starting the retrieve. For most kinds of fly fishing, your fly line needs backing: that is, some monofilament or braided, uncoated line is wound on to the reel first, and then the coated fly line is attached to it. Flattened monofilament of about 25 lb b.s., or special monofilament sold for backing purposes, is cheaper than braided backing line, and easier to connect to fly lines. Monofilament backing line is at-tached to the fly line with a needle-knot. The same knot can be used to tie a short piece of ordinary round-section monofilament to the other end of the fly line, to which in turn the tapered leader (cast) is knotted with a three-turn blood knot or a Double Grinner knot. All these knots are very secure, and have the advantage of being able to pass easily through the rod rings. The pale coloured lines are easier to see against dark reflections, but harder to see against a ripple or a bright reflection. 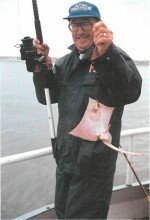 In certain conditions, such as in bright sunshine or against a dark background of rocks or trees, pale lines being false-cast in the air can scare fish. When lying on the water’s surface all lines viewed from below look dark, regardless of their actual colour. Damaged rod rings, grooved by c abrasive matter or with cracked centres, can destroy lines, and these § rings should be checked regularly and replaced if defective. Avoid dropping loose line on to sand or gravel, or anywhere involving the risk of its being trodden on with nailed boots or waders. 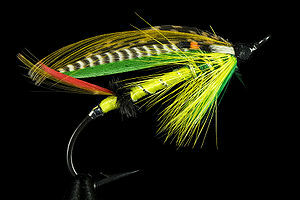 Good fly lines are expensive; they deserve care.